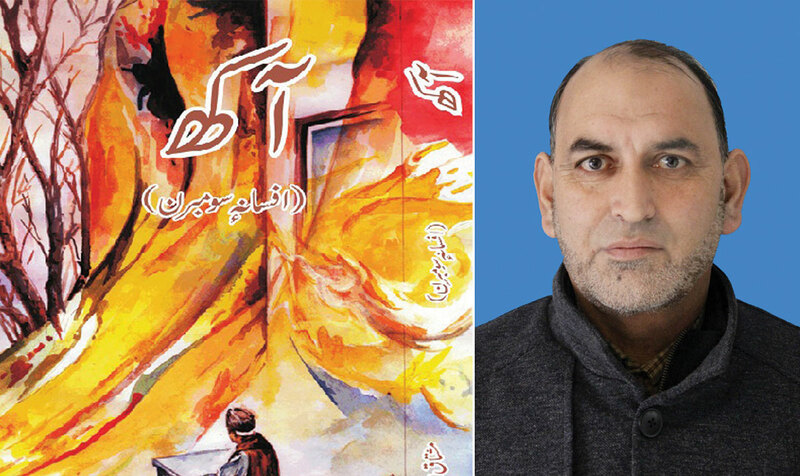 Mushtaq Ahmad Mushtaq and his short story collection, Aakh. It was for the third time that Piari went up the stairs to wipe down the floor of the veranda. But in the meantime, Lala Saeb came out from his room to sit there for a while. Piari was irked, but, casting an angry glance at him, did not utter a word. Piari, all fire, went in and Lala Saeb slowly sat down. It was already late afternoon and the compound was covered with evening shadows, only the top of the withered pomegranate bush in the compound was bright with the fading sunshine. The poor bush looked like a bundle of dry branches devoid of greenery and blossoms. Many a time, Piari had insisted her husband remove that shabby scar-like thing from the compound, but Lala Saeb stopped them. Piari used to have arguments with Lala Saeb almost on all petty issues like axing of the withered pomegranate bush; still, they live in the same house, nonetheless. Lala Saeb was on pension for over twelve years. Initially, after his retirement, he used to go outdoors almost at the office time. Apart from managing many household chores, he would go to the library to read the newspapers, have some gossip at the barber’s shop, paid caring visits to all the kin, and even helped his wife in the kitchen. Then his wife died and he contracted ‘sugar disease’ and eventually, he grew feeble to the extent that it was impossible for him to move around. He cannot even go to get his pension. He either keeps relaxing in his room or sits mutely lost. He occasionally switches on the TV to have a little diversion of mind. If nothing he might sit on the veranda and keep gazing at the withered pomegranate bush. In the waning sunshine, Lala Saeb had a momentary delusion that the withered pomegranate bush would burgeon again and become a bright flame for its red flowers. He remembered a long forgotten thirty to the thirty-five-year-old scene when a pomegranate orchard bloomed all around his old mud house. There was some festivity in the house for a little male child was born to him after his three daughters. Before the baby was old enough to go to the school, he used to frolic and play with his sisters and cousins in the same pomegranate orchard. They called him Shahzadah (the prince). Lala Saeb and his wife felt that they had attained all the joys of life; they neither were deficient of anything nor were they helpless in any way. Shahzadah continued growing, and the brothers of Lala Saeb decided to construct their new houses where the old one stood, cutting the pomegranate bushes commenced. Saba Lala was the first to construct his separate house, then Ghulam Rasool, and finally Lala Saeb who spent all that he had saved after marrying away his daughter in constructing his present concrete house so that Shahzadah never felt poor in comparison to his cousins. All the remaining pomegranate bushes were cut down when the house was constructed; the present bush, standing withered in a corner of the compound was saved by Lala Saeb’s wife as a keepsake. The bush bloomed every year even being close to the concrete fence, but strangely, the bush started withering soon after Lala Saeb’s wife left for heavenly abode. With these thoughts, he again cast a look on the withered bush; dusk had almost set. The bunch of dry withies of a pomegranate bush really looked incongruous with respect to the verdure of the lawn and the pretty array of flower beds. Heaving a deep sigh, he rose with the support of the wall and entered his room. A little while later, Piari came in to ask him if his medicine was finished. Lala Saeb did not tell her anything about his medicine; rather he asked her if she had heard the news. “They say that the government has issued appointment orders to two hundred young men,” she said with a frown on her forehead. “Then why don’t you tell Shahzadah Lal to arrange for some money and start his life. That would make my death easy,” Lala Saeb said very timidly. “What meaningless things are you saying? These two hundred jobs were doled out to those persons who had lost some relative in their family during the turmoil.” Giving a yank, Piari continued, “Altamash, you know Shahzad’s friend, also got his employment order. His father, you know, was killed in firing while he was on his way to the bank to collect his pension. Not only he got a job but also an ex gratia compensation of one lakh rupees.” With this Piari made another yank and left the room. Having heard what Piari said in reply, Lala Saeb’s whole body was drenched in cold perspiration. He was dumbfounded. He began to feel as if some angry axe-man was felling the withered pomegranate bush.